If I want privacy, then why shouldn't the government get that, too? Isn't governmental secrecy, in fact, a real benefit to us all? If the government really had to tell the citizens what it was doing, how could it ever be effective in doing what needs to be done? Questions like these are addressed in a new book by Frederick A.O. 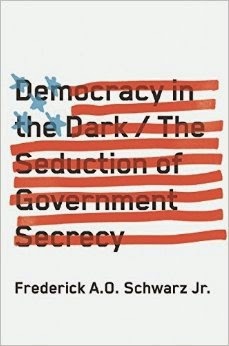 Schwarz, Jr., Democracy in the Dark. I haven't read the book. I did read a review. The review I read was published in the April 29, 2015 edition of The Wall Street Journal; it seems to indicate that Schwarz comes down firmly on both sides of the issue. Sometimes governmental secrecy is bad. Sometimes it's good - or at least justifiable. Speaking as a citizen, there is a big problem with governmental secrecy, and with giving "privacy rights" to our government, with respect to what the government is doing in our name. What you do is your business. What I do is my business. What the government does is OUR business. So, we have to know what the government is doing, or we can't effectively be in charge of the government. We can't be in charge of "our business" if we don't know what our employees are doing. What we are called upon to do, as citizens, is to be in charge of the government. That is what "self government" is all about. My simple (but I think not simplistic) response to claims that the government is entitled to secrecy: No it's not! Government doesn't get to keep what it does secret. Not if we care about having the government work for us, rather than the other way around!